Hey kids! 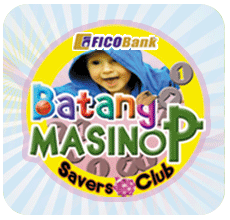 Join FICOBank’s exciting savers club for kids like you—the Batang Masinop Savers Club (BMSC)! It is a unique club where kids will have fun, as they learn and value the importance and benefits of saving. Not just that! They will also directly learn how a simple savings account works and experience transacting with a bank. BMSC aims to inculcate the time-honored value of thrift and saving into the children’s minds. It is especially designed to motivate the kids to save and encourage them to continue their saving efforts for as long as they can. It is also an excellent aid for parents to teach their kids about money. Club membership is open to children up to 12 years of age. He/She must open a Batang Masinop Savings Account (BMSA) at any FICOBank branch or extension office. A minimum of Php100.00 initial deposit is required. Batang Masinop Savings Account is a special type of deposit product for kids. Transactions are recorded in a passbook. Maintaining balance is Php100.00. Interest-earning balance is Php500.00. Interest will be computed based on the prevailing Bank rate, compounded quarterly. Upon opening of new account, a depositor will be given a BMSA especially-designed passbook. There are no restrictions on withdrawal, and the fund can be accessed through over-the-counter withdrawal. Deposits are insured with the Philippine Deposit Insurance Corporation (PDIC) up to Php500,000.00 per depositor. They will be motivated to save because of learning—at an early age—the value and benefits of saving, aside from the prestige and privileges of being a BMSC member. BMSA is a great any-occasion gift for kids and is a good tool for them to teach responsible money management. So, join the Batang Masinop Savers Club now and start investing on your bright future here at FICOBank!